For those looking for entertainment in Des Moines, head over to the Des Moines Civic Center. 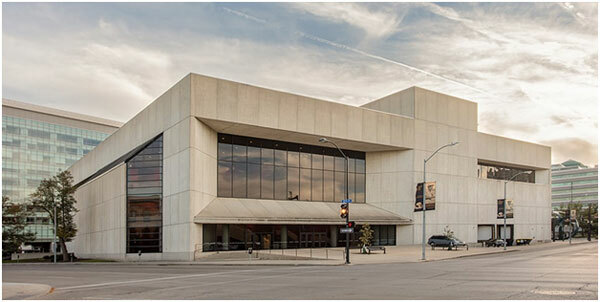 The Des Moines Civic Center is a 2,500+ seat facility owned and run by the Des Moines Performing Arts. The Des Moines Performing Arts is a not-for-profit organization for art. They present world-class productions and performances, such as the Wellmark Blue Cross and Blue Shield Family Series. Also, you might be able to catch famous performers and bands here. The ticket office is open Monday through Friday from 9 in the morning to 5 in the afternoon. The Civic Center is closed on the weekends and major holidays. Pricing depends on the performance and show. 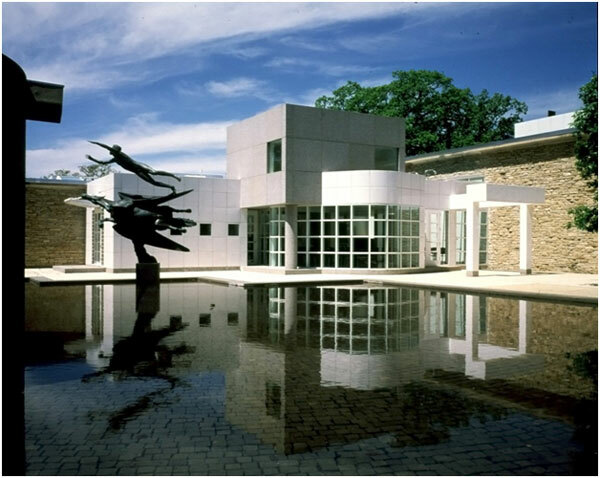 The Des Moines Art Center is a popular art museum, which was founded in 1948. The center features world class art pieces, paintings, and sculptures and statues. Also impressive is the architecture of the building, combining different forms of art architecture styles. The galleries feature exhibits from famous artists like Matisse, Monet, and several more. The center features large collections of both temporary and permanent collections. Temporary exhibits usually are displayed in the main gallery for anywhere from one to three months. Unlike many other art museums, the Des Moines Art Center has free admission. The art center is open Tuesday, Wednesday, and Friday from 11 am to 4 pm. On Thursday, they are open from 11 am to 9 pm. On Saturday, the museum is open from 10 am to 4 pm; and on Sundays, they open at noon and close at 4 pm. They are closed on Mondays and major holidays. Do you enjoy sports? Des Moines has you covered with their Wells Fargo Arena. Different teams with different sports play in the multi-purpose arena. One of the teams is the Iowa Wolves. They are an American professional basketball team that is affiliated with the NBA’s Minnesota Timberwolves. If you’re more of a football fan, catch a game of the Iowa Barnstormers. The Barnstormers is a professional indoor football team that compete in the Indoor Football League. The third and last team that plays at the Wells Fargo Arena is the Iowa Wild. An ice hockey team, they are affiliated with the NHL’s Minnesota Wild. Game times and ticket prices depend on the game, seating, and team. 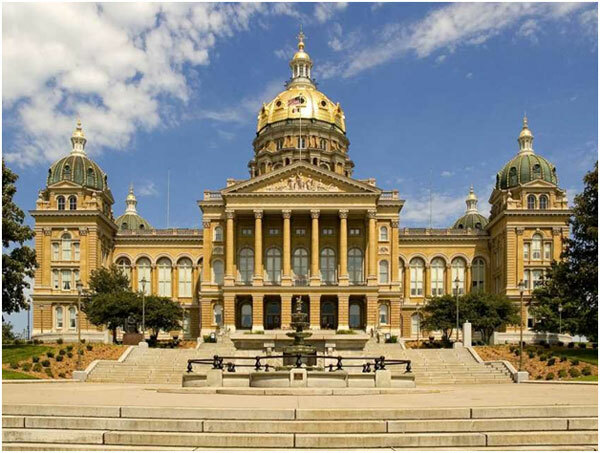 What better historic place in Des Moines is there than the Capitol building? The Capitol building offers free guided tours, as well as the chance to walk around by yourself. Tours begin on the ground floor and work their way up. The capitol building was built between 1871 and 1886, showing a great example of beautiful architecture. The building’s style is made of Neoclassical architecture. Probably the most spectacular part of the building is the large center dome. The building’s dome is covered in beautiful 23-carat gold leaf. The Capitol is open from 8 am to 5 pm Mondays through Friday. On Saturday, they open at 9 am and close at 4 pm. The Capitol is closed on Sundays and major holidays. Tours are available during the operating hours. 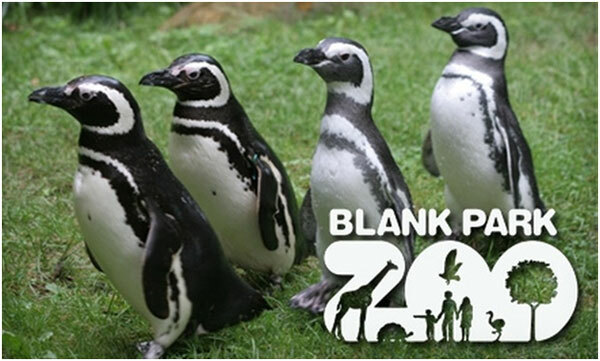 If you’re looking for a zoo to visit while in Des Moines, head over to the Blank Park Zoo. Originally began as a children’s zoo in 1996, it is now the only accredited zoo in the state of Iowa. While there are many exhibits, some popular exhibits include the Discovery Center, the African Boardwalk, the Aquarium of the Discovery Center, and more. If you’re bringing your family to Des Moines, this zoo is one of the best places to visit, especially since the admission price won’t break your bank. For adult (13-64), the price is $14. For seniors, admission costs $3 dollars less, sitting at $11. Children aged 3 to 12 have to pay $8; and those under 3 can have fun for free. If you buy your tickets online, the cost is slightly lower. Through the months of May to September, the zoo is open between 9 am to 5 pm. October through April, the zoo opens at 10 am and closes at 4 pm. They are also closed on major holidays. 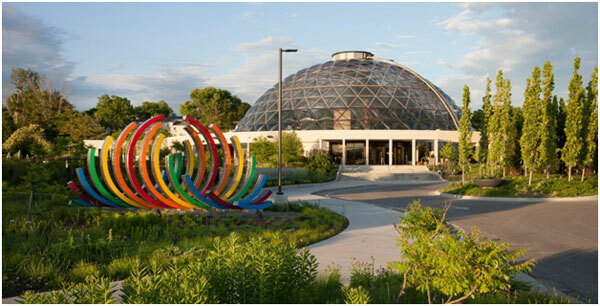 The Greater Des Moines Botanical Garden is one of the most popular attraction in Des Moines. The 14-acre botanical was originally begun as a city greenhouse in 1939. Later in 1979, the botanical garden that is here today was established. The garden currently holds more than 1,200 various plants. The mission of the garden is “to celebrate and explain the world of plants.” Some popular collections include those of Bonsais and Orchids. Throughout the year, the garden also hosts occasions, such as Garden Growers, Story Sprouts, and Yoga at the Garden. Entrance to the garden for adults costs $10, $9 for seniors and military personnel, and $7 for children 4 to 17. Those who are members or under 4 enter for free. The Greater Des Moines Botanical Garden is open every day for the public unless it is a major holiday. 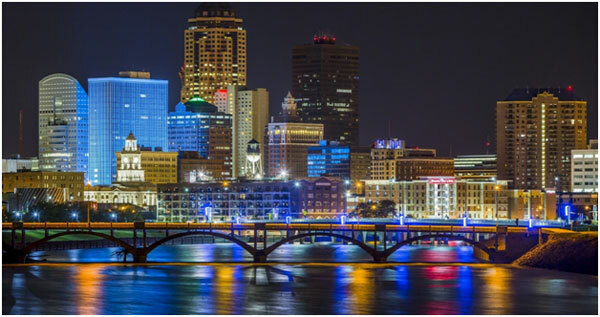 The best way to tour the city of Des Moines (as well as many other cities) is by chartered buses and vans. Explore at your own pace within the safety of your private vehicle. Don’t worry about ordering an Uber or Lyft when you have your own exploration vehicle. Through Prompt Charters, you can order the buses you need. Prompt Charters is an amazing, affordable chartered vehicle company that caters to your every needs. Whether you need a bus for school trips, marriages, parties, campaigns, or whatever else, Prompt Charters can help you. Prompt Charters offers buses, mini buses, school buses, party buses, and more. Most activities and destinations listed above and below are accessible by chartered buses. Visit promptcharters.com to book your rental bus today! Downtown Farmers’ Market –TheDowntown Farmers’ Market is the place to go for fresh goods. Some of the food offered here by local farmers include fresh fruit, vegetables, eggs, and cheese. There is also a great selection of fresh meat like chicken, goat, lamb, pork, and turkey. 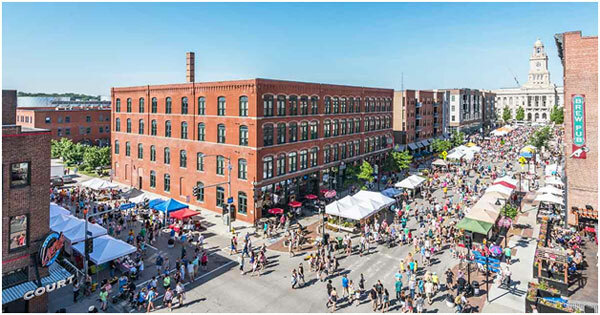 East Village – This is another great place to shop in Des Moines. Here, you can find a variety of shops such as eateries, small-scale retailers, boutiques, home décor stores, and specialty shops. There are also several services offered here. Jordan Creek Town Center –The Jordan Creek Town Center is a popular mall in West Des Moines. Here, shop the brands you love, eat the food you love, and spend time with the people you love. Activity-wise, there is a lot of entertaining things to do. 801 Chophouse –Who doesn’t love food from a nice, fancy restaurant? Well, that’s what the 801 Chophouse is. 801 is an American steakhouse with a price of $$$$. It is also rated the best fine-dining restaurant in Des Moines by tripadvisor (in 2018). Skip’s –Skip’s is a local restaurant that is a favorite of pretty much everyone who’s eaten there. The American restaurant is both vegetarian and vegan friendly. Don’t worry meat lovers; Skip’s has you covered! The restaurant is rated the #1 local cuisine restaurant in Des Moines by tripadvisor (in 2018).